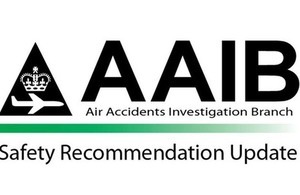 Safety Recommendation documents have been published for the following aircraft accidents. Beech B200 Super King Air, G-BYCP. Descent into terrain following departure from Stapleford Aerodrome, Essex, 3 October 2015. Hawker Hunter T7, G-BXFI. Crashed onto public road during air display, near Shoreham Airport, 22 August 2015. Silent 2 Electro, G-CIYA. Crashed during initial climb after self-launch, Husbands Bosworth, 19 October 2015. Folland Gnat T Mk 1, G-TIMM. Loss of control and impact with terrain during a flying display, Oulton Park, 1 August 2015. Cessna 402B, G-MAPP. Left main landing gear collapsed during landing roll, East Midlands Airport, 14 January 2016. Eurocopter AS332 L2 Super Puma, G-WNSB. Crashed in the sea on approach to Sumburgh Airport in the Shetland Islands, 23 August 2013. Where responses are yet to be received, this may be because addressees have 90 days to respond to a Safety Recommendation. The AAIB will keep open Safety Recommendations where it expects to receive responses from the addressee. If no further response is expected the recommendation is Closed. A Closed status does not mean the actions for a Safety Recommendation are complete, nor that the Safety Issue has been addressed. A ‘Not adequate’ assessment means that the response does not address the intent of the Safety Recommendation nor does it address the safety issue concerned. A ‘Partially adequate’ assessment means the response goes someway to meeting the intent of the Safety Recommendation and the action will address the safety issue to a certain extent, but further action would be required to fully address the issue identified. An ‘Adequate’ assessment means that the response fully meets the intent of the Safety Recommendation and the action will address the safety issue.